Sen. Bernie Sanders (I-Vt.) on Monday became the first U.S. senator to say he would boycott Israeli Prime Minister Benjamin Netanyahu's address to a joint session of Congress next month. 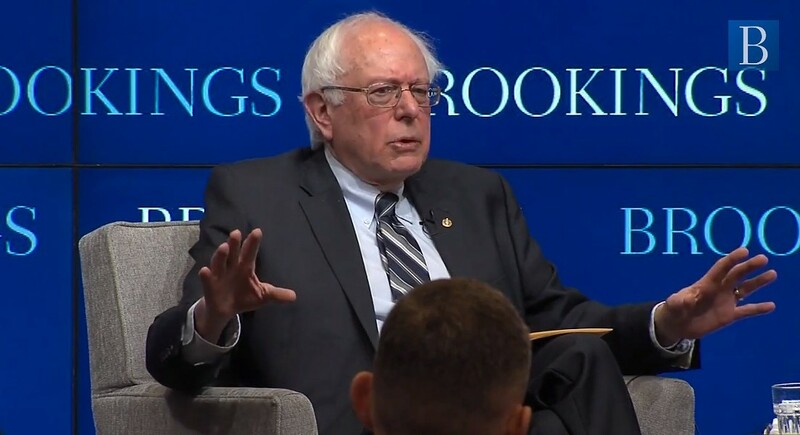 During an appearance at the Brookings Institution, Sanders joined a growing chorus of criticism over House Speaker John Boehner's decision to invite Netanyahu to the nation's capital without going through the customary diplomatic channels. "The president of the United States heads up our foreign policy," Sanders told moderator E.J. Dionne, a Washington Post columnist and fellow at the Washington, D.C., think tank. "The idea that the president wasn't even consulted — that is wrong and not a good thing for our country." Asked by Dionne whether he was "thinking of not going," Sanders replied, "I'm not thinking of not going. I am not going. I may watch it on TV." Prior to Sanders' remarks, several House members had said they would boycott the speech. Advisers to Vice President Joe Biden said scheduling conflicts would keep him from attending. Later Monday, Sanders' district-mate, Sen. Patrick Leahy (D-Vt.), said he, too, would skip it. “The unfortunate way that House leaders have unilaterally arranged this, and then heavily politicized it, has demolished the potential constructive value of this joint meeting," Leahy said in a statement. "They have orchestrated a tawdry and high-handed stunt that has embarrassed not only Israel but the Congress itself." While Sanders was the first senator to say he'll boycott Netanyahu's address, Leahy plays a much larger role in U.S. foreign affairs. Until January, he chaired the Senate Appropriations Subcommittee on State and Foreign Operations and now serves as its ranking member. The third member of Vermont's congressional delegation, Congressman Peter Welch (D-Vt.), told Vermont Public Radio's Bob Kinzel last Friday that he would attend the speech. Like Sanders and Leahy, Welch criticized Boehner's decision to invite Netanyahu without consulting the president, calling it "a major mistake." He said he was particularly concerned that the address comes as U.S. and Iranian negotiators work toward a nuclear agreement — a process Netanyahu has panned — and as the Israeli prime minister faces reelection. "So I think it was just bad timing and lack of, I think, deference to the usual protocols," Welch said. "And my preference would be that the prime minister postponed his speech until after the deadline on these Iran negotiations and after the election. I don't think Congress should become a forum, basically, for political campaigns in other countries." On the other hand, Welch said, "I've always attended when I can, schedule permitting, visiting foreign leaders. And I believe, on behalf of Vermont, my responsibility is to show respect for foreign leaders who come to Congress." Though Sanders’ remarks about the Netanyahu address dominated press coverage of his appearance at Brookings, much of the event focused on the senator’s economic agenda — and his presidential ambitions. Sanders delivered a half-hour lecture outlining his so-called “Agenda for America” and spent another 40 minutes answering questions from Dionne, fellow journalists and members of the audience. Noting that he has never run a negative television advertisement in his political career, Sanders said he would not seek to tarnish Clinton’s reputation in a possible primary. Rather, Sanders said, he would seek to focus on the issues he cares about most. Corrected Tuesday, February 10, at 5:01 p.m., to reflect the fact that Leahy no longer chairs the Senate Appropriations Subcommittee on State and Foreign Operations.